USB Extenders | Simply Connect Pte Ltd.
USB extender cables allow you to extend the distance between your computer and USB peripheral devices by several meters. These cables correct and transmit the signals as necessary to ensure optimal signal integrity. UCE260 can easily send the USB signals via Cat.5/5e/6 cable up to 60 meters (196 ft) at data rate of High Speed (480Mb/s) , Full Speed (12Mb/s) and Low Speed (1.5Mb/s). As USB 3.0 devices are getting popular, the demand for extending the distance covered by USB devices is growing notably. The UEH4002 incorporates technology that enables users to extend beyond the standard 5 m cable limit for USB peripheral devices. Up to 4 USB devices can be connected to the Remote unit up to 100 meters from the computer. The UE2120H allows users to extend the distance between a computer and USB device(s) up to 12 meters via the active extender hub. USB signals transmitted through these cables maintain optimal signal integrity and meet USB 2.0 standards. UCE60 lets you locate your USB device or hub up to 60m (198 ft) from you computer, overcoming the typical USB cable limitation. 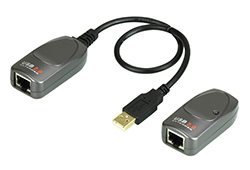 It conditions the USB signals to communicate up to 60m using low-cost Cat 5/Cat 5e/Cat 6 cable. The UE250 allows users to extend the distance between the computer and USB devices up to 5m via the dynamic extension cord. USB signals transmitted through them to maintain optimal signal integrity and meet the USB 2.0 standard. The UE150 allows users to extend the distance between the computer and USB devices up to 5m via the dynamic extension cord. USB signals transmitted through them to maintain optimal signal integrity and meet the USB standard.